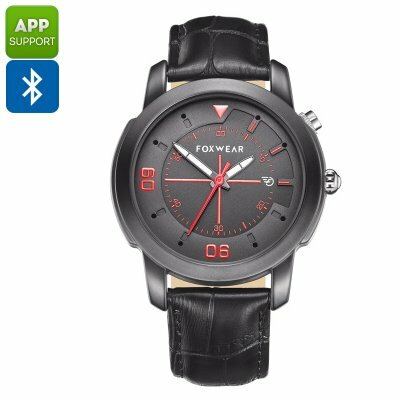 Successfully Added Foxwear Y22 Sports Watch - Bluetooth 4.0, Sleep Monitoring, Pedometer, Calories Burned, Swiss Ronda 751 (Black) to your Shopping Cart. The Foxwear Bluetooth sports watch is a remarkably stylish wrist watch that, unlike most sport watches out there, features an old-school quartz design. Along with its high-end leather strap, this smart watch can be worn with confidence at any occasion. Whether you use it as a state of the art fitness watch to track your exercise levels, or simply want to use it to keep track of time during a business meeting or evening out – the Foxwear Bluetooth watch is guaranteed to meet your demands. Additionally, this smartwatch also features a weatherproof design, allowing you to use it in any weather condition. Despite its business look, this Bluetooth watch features some top notch smart health features through which it assists you to reach your upcoming health goals in no time. An accurate pedometer keeps track of all the steps you took throughout the day while simultaneously calculating the distance covered. Additionally, a calorie counter informs you about the amount of energy you have burned throughout the day, giving you a clear insight on how efficient your latest workout session really was. Added to all these active fitness tools, the Foxwear Bluetooth sports watch furthermore features a sleep monitor that assures you’ll get enough rest in between your workouts – stimulating your recovery and thus allowing you to reach your fitness goals as fast as possible. When synchronized with your smartphone through Bluetooth, this smartwatch allows you to instantly record all your fitness activities along with the highly accurate analytic reports via the dedicated mobile application. Additionally, it will keep you updated about all incoming phone calls, messages, and social media notifications – ensuring that you’ll always stay up to date about your friend’s whereabouts and never miss an important message or call again. Through the mobile application, you will furthermore be able to instantly share your workout reports and fitness data on social media – allowing all your loved ones to stay up to date about your latest fitness achievements. This stylish smartwatch packs both an 85mAh Bluetooth battery to power all its fitness features for up to 15 hours, as well as a regular button battery that powers your clock for an astonishing 2 years. By featuring two batteries, this sports watch makes sure that once your Lithium Bluetooth battery ran out of juice, you will still be able to use your clock as a regular watch. Perfect to be used as a high-end fitness accessory or simply as a stylish wrist watch to keep track of the time – the Foxwear Bluetooth sports watch is guaranteed to meet the liking of everybody out there. The Foxwear Bluetooth sports watch comes with a 12 months warranty, brought to you by the leader in electronic devices as well as wholesale electronic gadgets..